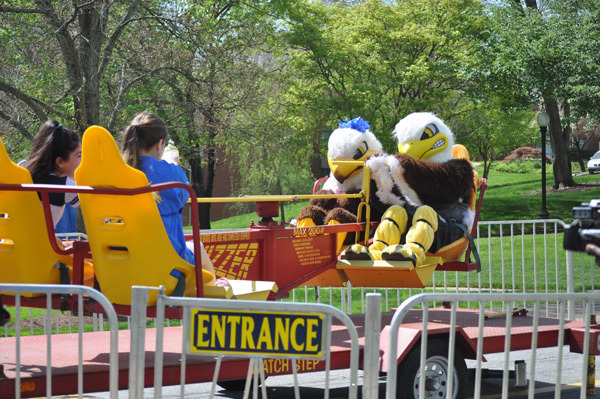 SOAR and Lady SOAR enjoy the Wizzer with students during Spring Day 2015. Get your carnival on Thursday, April 7, with fun and games for Spring Day 2016. Classes are cancelled and everyone is invited to come out and enjoy carnival style rides and games, free giveaways and delicious carnival fare. Games and activities include: volleyball, Battleship, Bocce Ball, flag football, paint party, dodgeball, kickball, ultimate challenge and the Wizzer. Carnival highlights include a duck pond, corn hole, bean bag toss/milk bottle knock down, funny photo booth, dunk tank fundraiser, egg race/sack race, hula hoop competition, sunscreen station, tape the professor fundraiser and snow cones. Spring Day is planned and sponsored by the Student Activities Council.